2014 is an exciting year for Glasgow, and there is definitely a buzz in the air! As proud host of this year’s Commonwealth Games all eyes are on the city we call home. With not much longer to wait until the games begin we present our list of the top spots and attractions to visit whilst in Glasgow. Hop on the subway to Hillhead station and you'll find yourself in the heart of the West End. Take a stroll along the famous Byres Road and you are bound to stumble upon some of the city’s best independent shops, cafes, restaurants and bars! 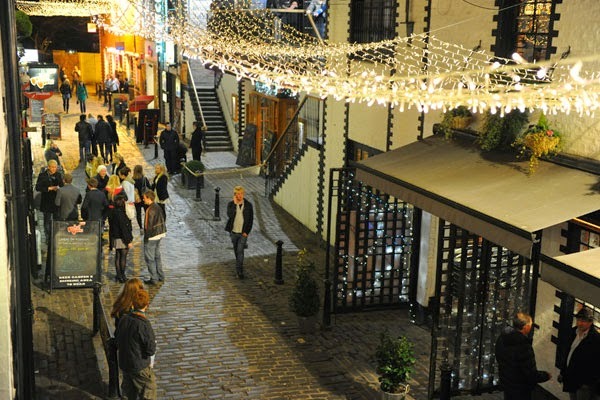 Situated just behind the subway is Ashton Lane, a beautiful cobbled backstreet which bustles both day and night. Popular with the locals, here you will find a variety of bars and restaurants including the infamous Ubiquitous Chip. We recommend heading for the bar on the roof to enjoy a drink in the open air! The lane has something for everyone, and once you’ve tucked into lunch or dinner in one of the lane’s independent food joints, you could even head to cosy Grosvenor Cinema to catch a movie! If you fancy some theatre at lunch why not head to the Oran Mor at the top of Byres Road opposite the Botanic Gardens. The famous A Play, A Pie and A Pint impressively takes place every lunchtime and gives exactly what it promises. A unique experience located in a charming setting. We must advise you not to be alarmed to see shirtless men roaming the streets on a sunny day. We have a tradition here in Scotland - When the sun's oot..TAPS AFF! If you are lucky enough to find yourself in Glasgow on a sunny day, the city has many beautiful parks which come to life in the sunshine. Grab a picnic blanket and some sunscreen and head to the Botanic Gardens or the much-loved Kelvingrove Park in the West End, Glasgow Green in the City Centre or Queens Park if you are in the Southside. We like to make the most of our summers here in Glasgow so there are many festivals of all kinds which take place in parks throughout the summer months. For those who need a cool down a trip to West Brewery next to Glasgow Green in the city centre is a must. 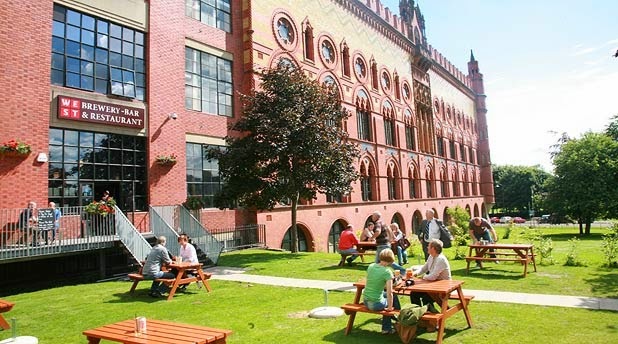 Located in the iconic Templeton building, enjoy a home brewed beer whilst basking in the Glasgow sunshine. The UK's largest and most successful shopping location outside the London's West End, Glasgow has an amazing selection of both high street and major department stores covering Sauchiehall Street, Buchanan Street and Argyle Street. However for those wanting something a little different, the city centre has many wonderful independent and specialist shops waiting to be found. 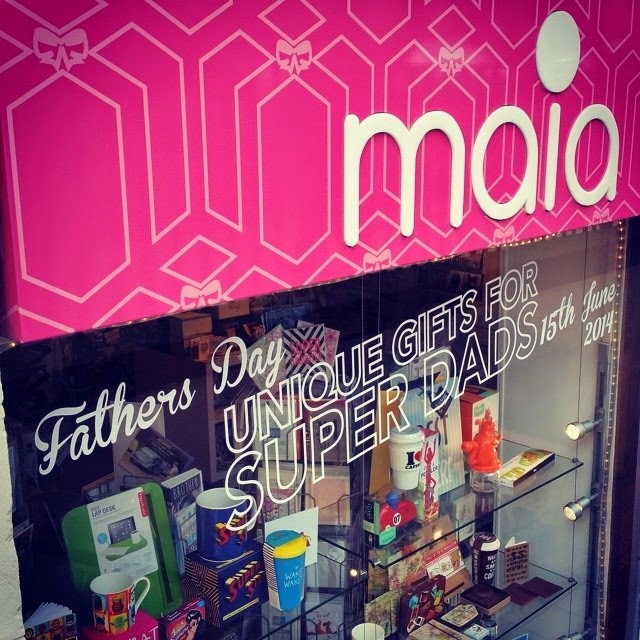 Just a step off Buchanan Street you'll find Maia, a treasure trove of gifts and lovely things. It is the perfect place to find that special wee souvenir from our city to take home with you! Whether you are treating yourself or picking a gift for someone you'll find it all here at Maia. You may think we are a little biased, but our customers tell us every day that we have a great selection of lovely gifts, and many are particularly delighted by our collection of Scottish gifts and things designed by local talent! Other highlights include Fat Buddha, a super trendy menswear store on St Vincent Street which stocks an amazing range of shoes, clothes, books and home accessories. For those looking for the finest bottle of Whiskey to take home from Scotland, the Good Spirits Company is the place to go. With friendly staff, a beautiful store and a very impressive knowledge of all kinds of alcohol, they also hold tasting events. Why not make an evening of it and learn all about your souvenir bottle of Whiskey, Gin or Scotch! Whilst Glasgow is moving on from its industrial background, it still is and forever will be the backbone of the city. There are many sites and museums to visit that allow you to delve into the rich history of Glasgow and understand why us weegies are so proud of our city. One of the best places to do this is at the Peoples Palace next to Glasgow Green. Structures on the River Clyde are where old meets new. The famous Finnieston Crane stands tall beside the impressive new Hydro arena. Further up the Clyde you'll find the home of Glasgow’s transport history at the Riverside Museum. Winner of the 2013 European Museum of the year, the building is worth a visit alone. A few other highlights include Glasgow Cathedral, the Necropolis and Tenement House. Architecture lovers should look up - us Glaswegians take for granted how beautiful our buildings really are. Glasgow is an amazing city for eating out. Despite what you read it's not all about deep fried mars bars. Glasgow has everything. From burger joints to fine dining the city has it all. For those after a traditional Scottish meal check out Sisters or Ubiquitous Chip both in the West End and why not try some traditional Scottish Haggis? You'll either love or hate it! In the city centre there is an abundance of choice. To satisfy that pizza or pasta craving, head over to Glasgow’s oldest Italian Restaurant, O Sole Mio, on Bath Street. We also recommend La Vita if you are near George Square. If you fancy a curry Glasgow has a few spots that rival London’s Brick Lane, including Mother India and Shish Mahal. However a visit to Balbirs on Church Street is a must offering heavenly tasting and surprisingly healthier Indian dishes in a beautiful setting! Glasgow has many wonderful Vegan and Vegetarian restaurants and cafes spread throughout the city. 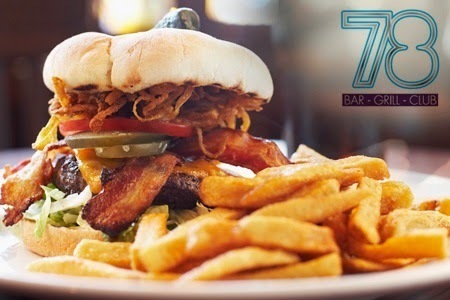 The 78 cafe bar on Kelvinhaugh St offers a very yummy range of dishes and snacks, and is a lovely place to hang out with friends. We cannot recommend the falafel burgers highly enough! Get there early to grab a seat on the sofa near the fireplace, and stick around after you have eaten as some evenings the 78 hosts Open Mic nights where you can enjoy a little music or comedy from the locals, and even take the mic yourself if you feel inspired! Mono, 13th Note, the CCA and Stereo are all a little more central and also offer delicious veggie food, not forgetting desserts! Glasgow’s nightlife truly has something for everyone. Sauchiehall Street, Bath Street and the Merchant City are the most popular areas in the city centre to explore on a night out in Glasgow and all offer different experiences with probably the same outcome - chips at Blue Lagoon! Sauchiehall and Bath Streets run parallel and offer a mix of restaurants, bars and clubs. The area is a great place to bar hop. You might find yourself in a Cocktail bar and cross the road into a quirky dive bar. Highlights include the Variety bar on Sauchiehall Street, a sticky old man pub by day and crammed with electro rock lovers by night. 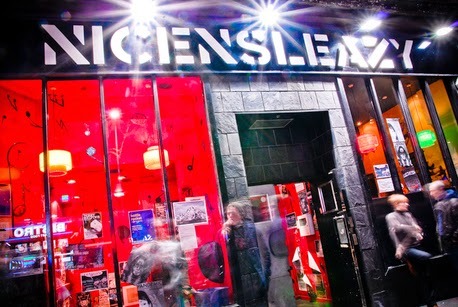 The famous Nice'n'Sleazys never disappoints, a grungy bar and club with loads of personality and a great place to catch a band or two aswell. The Merchant City is arguably the most beautiful area of Glasgow. Stylish bars and restaurants are surrounded by stunning architecture. Bar 91 and Blackfriars are buzzing most nights. Music lovers should check out the iconic King Tuts Wah Wah Hut and Bloc+, which offer live music every night of the week, and if it’s dancing you want don’t think twice about making your way to the funky Buff Club! These days more and more big artists are including Glasgow in their tour, check out the line up at the brand new Hydro Arena! For those who prefer a more intimate gig the famous Barrowlands offers an atmosphere like no other. Glasgow is an amazing city for art and culture. Three recent Turner Prize winners and three of this year’s nominees have all studied art in Glasgow. The proof is in the pudding! The city has many Art Galleries and Museums, ranging from big to very small, which showcase both world and local artists. Visit the GOMA for free in the heart of the city on Royal Exchange Square, and spend the afternoon admiring the installations and artwork spread throughout before making an important stop at the Gift Shop! 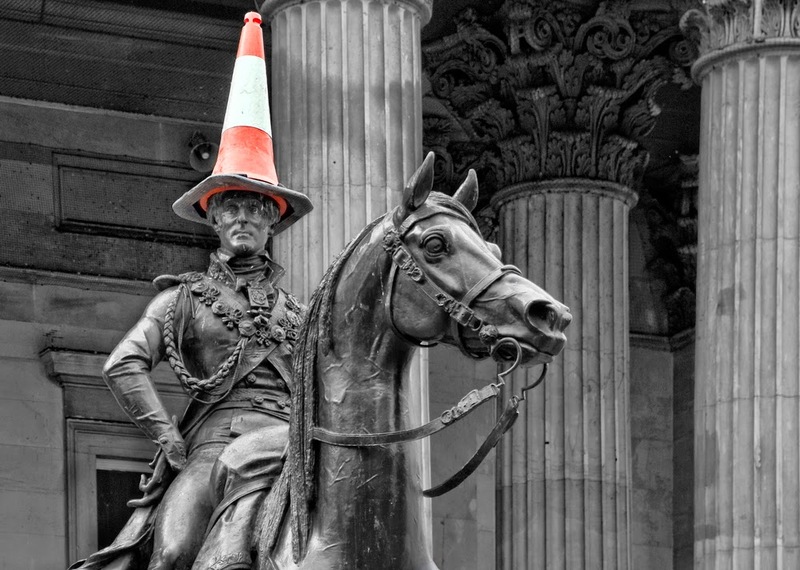 Outside you will find the famous Duke of Wellington Statue, lovingly adorned with a traffic cone on his head. The local council are not as impressed by the Dukes fancy headwear as the locals, and have attempted several times to take measures to put a stop to his ways, but the people of Glasgow are very committed to the Dukes quirky fashion and the statue has become arguably the most famous spot in Glasgow. 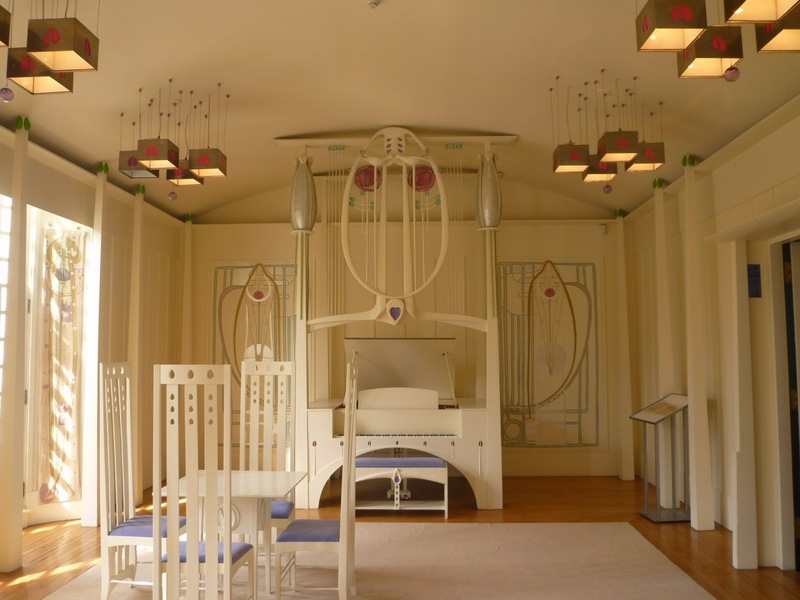 Charles Rennie Macintosh was a Glasgow Art Nouveau artist and architect of international significance. He designed the famous Glasgow School of Art building which sadly part of which now no longer exists due to a recent fire. This has devastated people throughout the world and robbed Glasgow of a stunningly beautiful piece of design and history - Once the top tourist destination in Glasgow the buildings future remains in the balance. Macintosh fans however can still visit the House for an Art Lover situated at Bellahousten Park or Kelvingrove Art Gallery to appreciate and give support to the work of one of Glasgow’s finest artists as we wait in hope of the Art School being restored. For those visiting the city with kids there are many fun things to do that won't break the bank. The Science Centre at the River Clyde offers a fun day out with interactive games for both the kids and adults. For the adventurous family a trip to Xscape at Braehead is a must. With indoor skiing, cinema, bowling, arcade, restaurants and shops you'll struggle to fit everything in! 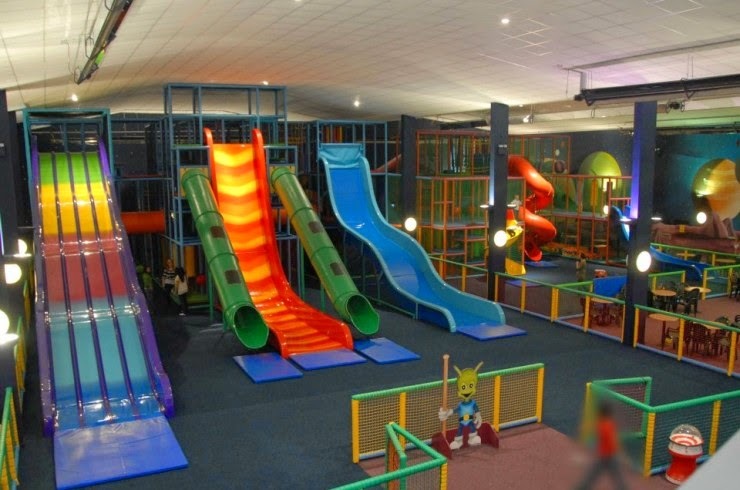 Adventure Planet is a great option for families with younger children, with a Baby & Toddler area as well as the Main Arena which has all sorts of fun apparatus, including a 20ft drop slide for kids who want to brave it! Mum and Dad can use the time to grab a coffee or bite to eat in the Café. Glasgow is very passionate about its football. Stadium tours at Hampden Park, Ibrox Stadium and Celtic Park are the perfect places to learn the rich and colourful histories of Scotland’s top teams. If football is not your thing why not support Glasgow’s other sporting clubs including the Glasgow Rocks Basketball team, Braehead Clan Ice Hockey team and the Glasgow Warriors Rugby team. Head along to a match to get a taste of Glasgow’s passion for their team, you are sure to be impressed! 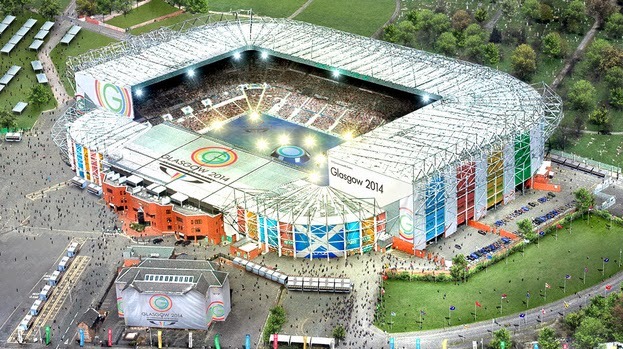 On 23rd July the world’s best athletes will arrive in Glasgow for the 2014 Commonwealth games. With 17 sports across 14 venues it is bound to be an experience like no other! The opening ceremony will take place at Celtic Park in the East End of the city. For those lucky to have tickets take time to explore the 14 Venues and soak up the atmosphere. We hope you will enjoy your visit to our beautiful city, and that you get a chance to visit some of the attractions we have mentioned! We are a stone’s throw from Buchanan Street and very close to the Bus Station and both Queen Street Station and Central Station, so make sure to pop in to check out our range of lovely gifts. 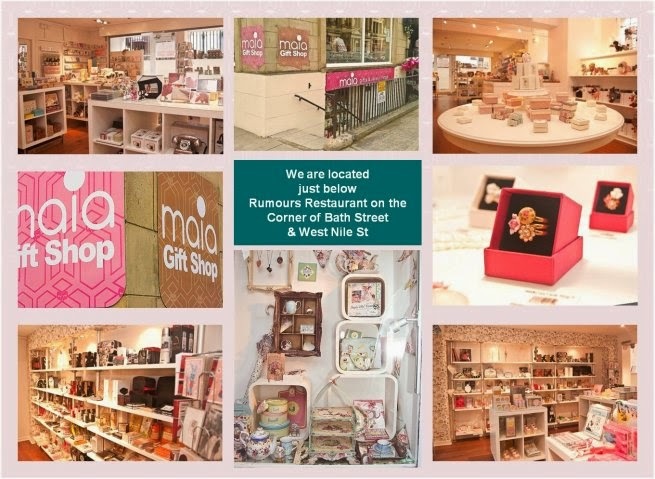 With a huge range of jewellery, handbags and purses, childrens toys, home accessories and of course plenty of Scottish goodies, you will find your perfect souvenir at Maia. 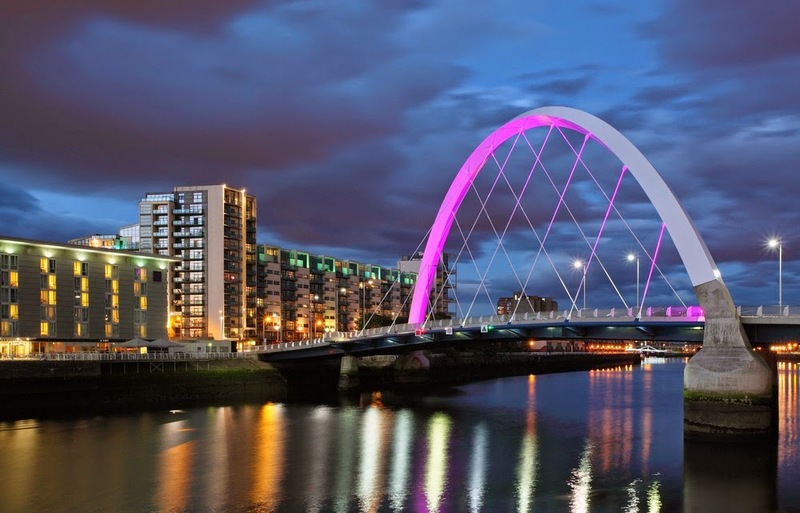 We would love to hear how you are spending your time in Glasgow!